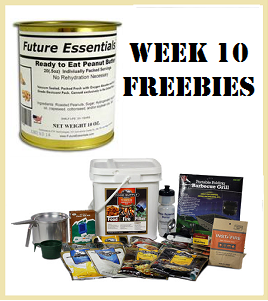 Our month-long prepper-fest of unprecedented savings, freebies, and other incentives is drawing to a close. (ENDED SEPT 30) If you aren't among the thousands who have taken advantage, then act now. - The Week-12 Freebie package in our ongoing series of Inventory Redistribution offers includes two of our most popular items. This week qualifying member purchases totaling at least $1250 get a free case of canned Bega Cheese (value $160). Qualifying member purchases of at least $2000 ALSO receive a case of Red Feather Butter (value $195). No coupon needed for these. They won't show in your cart. (One of each per household.) Expires noon, Sept. 27. - Also ... a coupon-code freebie for members and non-members alike (one per household for the month of September) ... use the FFFF coupon code with a qualifying purchase of at least $399. 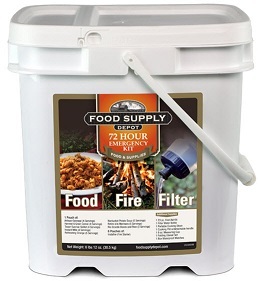 Do that, and you will receive the Food, Fire & Filter Bucket, value of $124! (When you enter that code, your purchase total will be reduced by one penny which will flag your order for us to include that freebie in your order ... it won't show in your cart). This coupon-code activated offer runs from Sept. 8-Sept. 30 only. The coupon code must be entered at the time of purchase. IMPORTANT NOTE: There are just 4 days left on our crazy, historic Mountain House Sale! For the details on those huge, unprecedented discounts and all the incentives that are available, click here. Final 7 Days: Historically Low Mountain House Prices & Crazy-Generous Incentives! 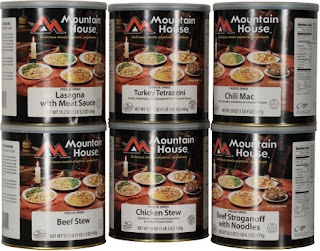 We are providing unprecedented discounts on all our #10-can Mountain House varieties--the prepper's dream: the ultimate 30-year shelf-life food. Our current MH can-case discounts range from 40%-65%. Our average MH can-case discount is 47%! Our club members (we're even giving away free lifetime memberships!) not only are enjoying the great prices & free shipping, but various significant incentives our programs like the FFFF offer below, our unique MH Royalty Rewards rebates, the weekly Fortify to Survive inventory reduction offers, and the 2013 Loyalty Royalty year-end rebates. The layers of opportunities here for you to take advantage of are stupid-crazy and without compare. Shop the MH Cans Sale. 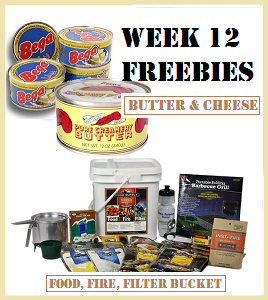 Week-12 Freebies include cases of Canned Butter & Cheese! NOTE: Many more MH backorders; act fast! 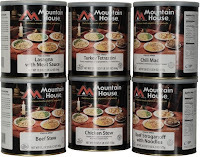 Ten days left in the unprecedented Mountain House food sale. The MH factory is doing its best to deliver on this historic sale's overwhelming surge in demand. Not surprisingly, as of yesterday afternoon, 27% of MH's canned varieties are now on backorder. That number will climb fast from now thru the end of the month. More on those specifics here. Our listings indicate, according to our latest reports from MH, which foods are on backorder (and scheduled to ship out again when available in October). For those items not on backorder, average shipping of MH orders is at 4-7 business days--pretty good for the wave of orders flowing thru. Act fast on our average 47% MH discounts to get your order in ... before that backorder hole gets any deeper. For more on our outstanding new member freebies and much more, see today's member email. 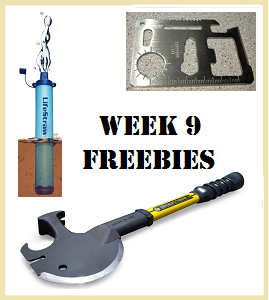 See Our Week-11 Freebies; Mountain House Prices & Incentives Still at Historic Levels! It just isn't EVER going to get any better than this. We still have two weeks left in this ridiculous sale. Did you notice that PayPal's "Bill Me Later" no-interest, no payment 6-month financing is available to qualified buyers? 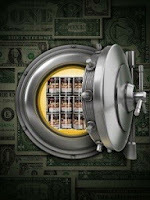 Just click on the PayPal graphics in our site for more info. Get whatever you need now ... the world isn't getting any saner. For all the latest, see today's member email. 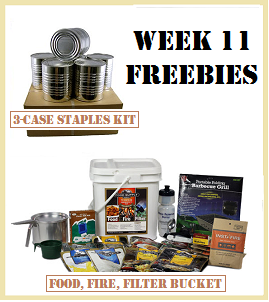 Historic Mountain House Discounts plus Multi-Layered Incentives equal "Preppervana"
Effective immediately, we're activating the club-member free case of 15-year Creamy Peanut Butter offer ... and effective September 8, the coupon-code offer for members and non-members too for the free Food, Fire & Filter Bucket will also be in place. Qualifying purchases required. For more info see today's club email. Important to note--we are in the midst of an historic Mountain House food sale, with discounts and prices not seen in decades. If you need to prep--this is your best chance to walk off with the best preps at your lowest cost. 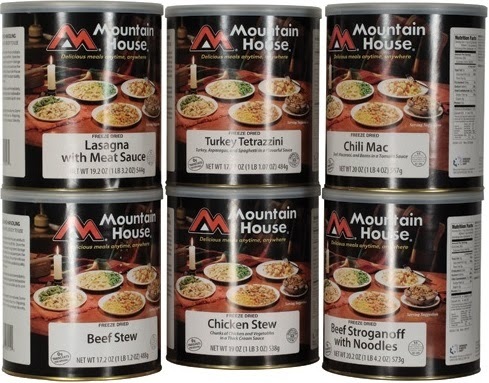 For the entire month of September, we are providing unprecedented discounts on all our #10-can Mountain House varieties--the prepper's dream: the ultimate 30-year shelf life food. Bottom line, we are offering prices not seen on MH food in decades (from 40% to 65%-off), not to mention free shipping to the lower 48 ... and our members will still ALSO get the various significant incentives our programs like Royalty Rewards, Fortify to Survive, and Loyalty Royalty have to offer. The pile of opportunities here for you to take advantage are breath-taking. Fair warning ... we've seen several consumer stampedes for MH food thru the years for various reasons. We've gone thru periods when the order backlog has stretched for months. Orders are already pouring in for this opportunity ... I fully expect the MH pipeline is about to be overwhelmed. My sincerest advice is to get your order in as early in the month as you can to minimize the wait for your order to process and ship. See today's entire member email notice.